Tonight's images are two of my favorite items in my autograph collection. The top one is a hall of fame program signed by a bunch of baseball hall of famers. 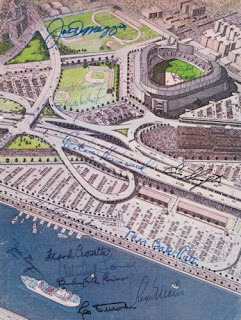 The bottom one is a map of Yankee Stadium which is signed by some rather famous Yankees. 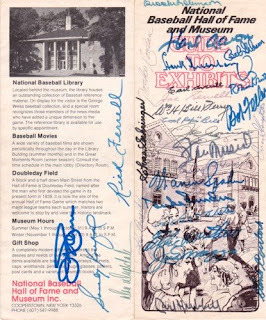 If you look at the blue signature right above the water, you'll see that it is Mrs. Babe Ruth. Very kewl if I may say so myself. Autograph collecting is one of my hobbies and over the last thirty or so years, I've managed to acquire quite a few of them. I may share more later. Today, I revisited my favorite David Bowie CD: Diamond Dogs. I got it when it first came out back in 1974. It was an album back then, but it has always been my favorite. The concept of the album, the musical arrangements, and the lyrics all speak to me in ways none of his other works do. Give it a listen. I'm sure you'll like it. I'm still reading Ravenshade by C.S. Marks, though I'm almost finished with it now. I'm far enough along to say that it is well worth reading. C.S. Marks is a great storyteller. Both yesterday and today I worked on knaben nine. I finally finished Chapter 3 which may be cut from the final version. It focuses on one of those attention-demanding children that would not let me progress with the main story line. If it does remain, it does so on the fact that it explains the origin of the bear at the end of Chapter 2. The bear is very important to knaben nine as he works his way through the tasks. It would be a shame if he loses it somewhere. The 0.99 cent sale of Shadow of the Ghost kindle edition is now over. When last I checked, 49 copies of the kindle edition sold last month. Hopefully, most of those that bought it will enjoy the story. If anyone is interested in winning a signed copy of the paperback edition, check out the contest here. More later. I hope everyone has a great, virus free, April Fool's Day! OKay-- you were already cool, but your coolness factor just increased exponentially... way to go! 49 copies! Way to go!! Another sample of "kaben nine"